Here are a few frequently asked questions (FAQ’s) we’ve received at Mindfulness Exercises. This is a great place to go to first for any of your questions. If your question is not covered here, Please contact us. Select any of the questions below for helpful tips and information. Mindfulness is the intentional, moment-by-moment awareness of our thoughts, feelings, bodily sensations, and surrounding environment. 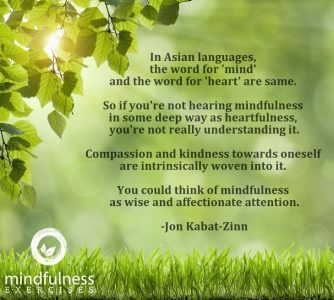 Mindfulness necessarily includes warm acceptance of external and internal conditions, meaning that we pay attention to our thoughts and feelings without judging them—without believing, for instance, that there’s a “right” or “wrong” way to think or feel in a given moment. When we practice mindfulness exercises, our awareness tunes into what we’re sensing in the present moment rather than replaying the past or planning for the future. [/su_spoiler] [su_spoiler title=”What are mindfulness exercises?”] Mindfulness exercises are training tools which help you live with more self-awareness and kindness. What sets our exercises apart are the combination of reflections, practices and exercises which help you bring awareness to your past, present AND future way of being in every area of your life. Pay focused attention to your breathing, especially when you’re feeling strong emotions. Notice intimately what you’re sensing. Can you notice the sights, sounds, or smells that ordinarily slip by without reaching your conscious awareness? Realize that your emotions and thoughts are very temporary and that they do not define you. What are the implications of this for you? Does it incentivize you to free yourself from negative thought patterns? Tune into the physical sensations of your body, from the water hitting your skin in the shower to the way your body rests in your office chair. [/su_spoiler] [su_spoiler title=”Can I save content to my computer?”] Paid members have full downloading privileges of our video, audio and worksheet content to their laptop and desktop devices. Our technology does not fully support downloading content to mobile devices. [/su_spoiler] [su_spoiler title=”Can you tell me more about Sean Fargo?”] I try to live a simple, meaningful life by helping as many people as I can apply kind awareness to their daily lives. Sustaining mindfulness has never been easy for me, so I’ve had to work really hard with all of the techniques that have been taught to me by my Eastern and Western masters. I’m no guru and I love cutting loose, but I’m also doing my best I can to live every moment with authentic love. Thank you for joining me on this path. For more of my background, visit my LinkedIn profile here. [/su_spoiler] [su_spoiler title=”Why is there a fee?”] In order to be a Buddhist monk in a monastery for 2 years, I donated all of my money and possessions to charity. Now as I integrate my mindfulness practice into the real world, I am in debt building this site, a resource which I hope brings relief, wisdom and love to a lot of people’s lives around the world. The vast majority of these files are covered by a “Creative Commons Some Rights Reserved” license. You can find these and many more talks at DharmaSeed.org. You can’t repackage talks to sell to others (as opposed to giving them away), nor can you use only portions of the talks in another project or product. You must always credit the person or organization who owns this Creative Commons copyright. If you give the talks to others, you must inform them the talks are protected by copyright in this way.